For introductory courses in Environmental Science, Environmental Studies, and Environmental Biology. 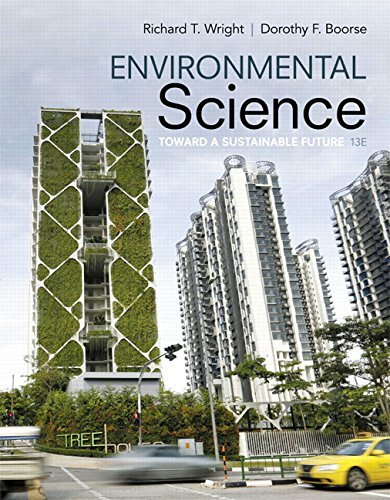 The 13th Edition of Environmental Science: Toward a Sustainable Future retains its current content and memorable themes of Science, Sustainability and Stewardship while expanding on the reader-friendly approach with built-in tools that make Wright/Boorse a bestseller. Presenting the most current and relevant Environmental Science issues and research along with new Concept Check questions and Understand the Data questions, the text and Mastering Environmental Science work together to help readers understand the science behind environmental issues. Mastering™ Environmental Science is an online homework, tutorial, and assessment system designed to improve results by helping students quickly master concepts. Students benefit from self-paced tutorials that feature personalized wrong-answer feedback and hints that emulate the office-hour experience and help keep students on track. With a wide range of interactive, engaging, and assignable activities, students are encouraged to actively learn and retain tough course concepts. For the 13th Edition, Mastering Environmental Science has been significantly updated to include new video assignments that expose students to real environmental issues and new coaching activities that help students build science literacy skills. Note: You are purchasing a standalone product; Mastering Environmental Science does not come packaged with this content. Students, if interested in purchasing this title with Mastering Environmental Science, ask your instructor for the correct package ISBN and Course ID. Instructors, contact your Pearson representative for more information. Environmental Science: Toward a Sustainable Future ,13 th Editionis also available viaPearson eText, a simple-to-use, mobile, personalized reading experience that lets instructors connect with and motivate students — right in their eTextbook.Learn more.